Our latest restoration is a beautiful 1951 Bang & Olufsen vintage radio. The partnership of Peter Bang and Svend Olufsen set out to produce early radio sets powered by mains electricity rather than battery in 1925. They built their radios in the highest quality cabinets and sold them at a price. Bang & Olufsen, the company, has continued to be respected for form and function. The Grand Prix 506 is a massive table-top mains valve radio with an impressive array of push-buttons. The wooden cabinet shouts quality, style and sophistication, with its flipping flip-up glass tuning scale, magic eye and even a set of bronze medallions. 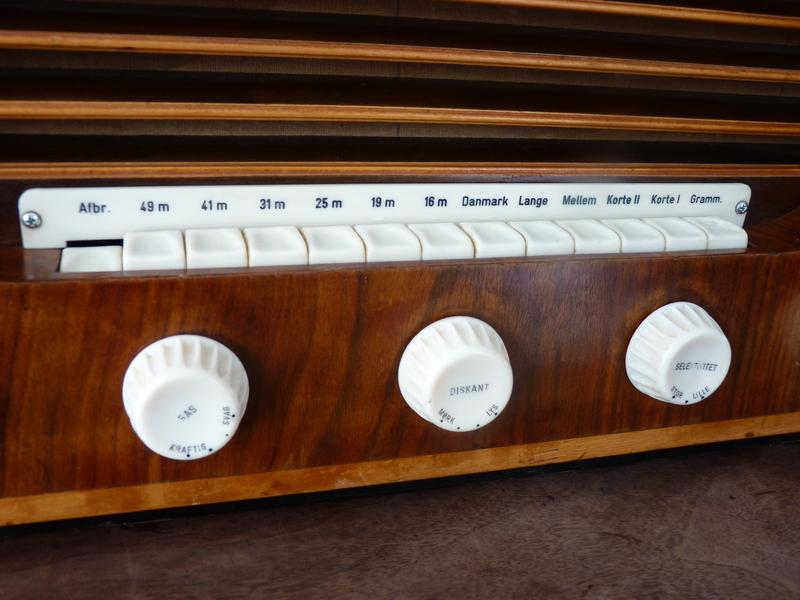 Pre-tuned factory settings, operated by push buttons were to become a B&O thing. After this radio has spent the last sixty odd years safely at home in Denmark, we had an anxious wait whilst couriers played pass the parcel across Europe. It finally arrived in one piece … but not working. After some considerable head scratching, Wayne worked his magic, skillfully sketching out his own schematic and now, not only is it a looker, the sound is impressively bold and loud. Sadly, very few Bang & Olufsen radios from before the nineteen seventies and eighties can be found here in Britain. We’re proper pleased to have had the opportunity to work on this one.